The Universal World Profile provides advice and resources for any referee wanting to flesh out the bones of a Universal World Profile (UWP). Turn a random string of numbers into a memorable and exciting scenario setting. The need to interpret the UWP data and fill in the blanks, has no doubt dissuaded many referees from creating their own subsectors for their own roleplaying universe. Here then is a step by step handbook to world creation and it goes without saying that you will need a copy of Cepheus Engine or any version of the classic 2D6 SF RPG on hand. Don't expect a technical treatise on planetary physics, though. You won't be dealing with albedo values, Bode's Law or complex square root calculations to determine the length of the world's orbital period. This book comes at world generation from another angle - from the perspective of plot. 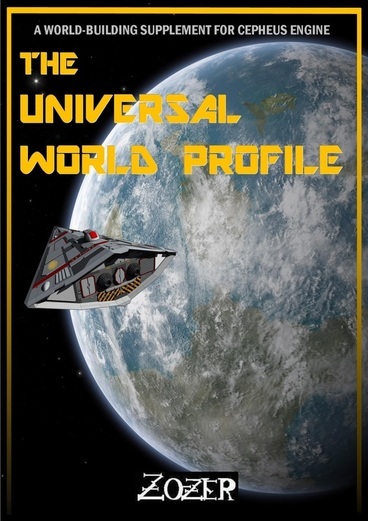 The aim of Universal World Profile is to assist the referee in creating believable descriptions of his worlds, useful for referees who are putting together a scenario, and for players who want to get their heads around the world quickly, so that they can make informed decisions in-game. There is no set worksheet that must be slavishly filled in by the world creator because every planet will be unique. Follow the creation of three very different worlds through the book. Build unique worlds, inspired by their UWP characteristics. In depth sections discuss Size, Atmosphere, Tech Level etc. Dozens of comparisons with real and fictional planets. Step by step process, allowing the referee to see the method in action. Antony F: Amazing wealth of information, and like all of the work tied to SOLO and their other publications, this is just a fantastic resource. Paul offers usable concise and inspiring insights into both how the UWP is often portrayed, and in expanding it to make worlds, and the situations and encounters, colorful, usable, and above all memorable. I cannot give this one enough praise.